GRAPHIC STUDY OF CHEMICAL AND PHYSICAL MAGNITUDES. In this activity you are going to create a chart showing the evolution of the intensity in the electric field between two charges Q1 and Q2 located at one meter away. This is the formula that calculates the intensity in a given point…. The intensity of an electric field is a vector, but as you work along a segment, we will only consider the module of the vector and the direction will be ignored. Open the L.O.Calc. Open your student template . Open the sheet .8.1 Intensitat d'un camp elèctric. 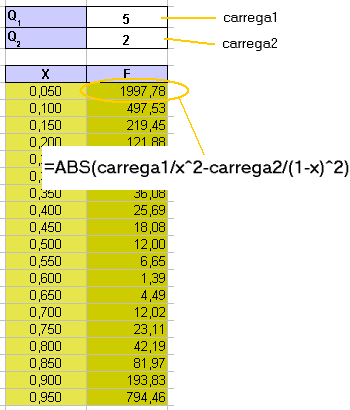 Define the cells where it is located the Q1 value as carrega1. 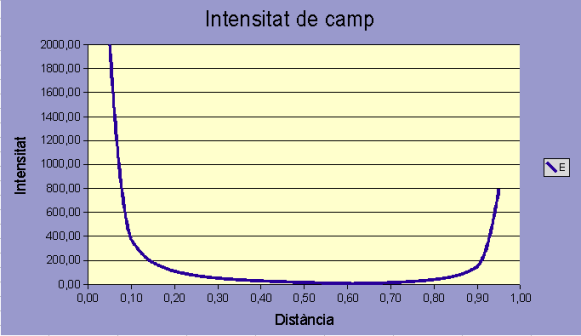 Define carrega2 ( the cell where is located the Q2 value). In this chart you won't need to add secondary axes. Try to get a format similar to the shown in the image below.